Studied Kenpo Karate with Ralph Castro in San Francisco from 1963 to 1967. Studied Yang Style with Choy, Kam-Man in San Francisco in 1968. Moved to southern Oregon in 1973. Taught Yang Style and self defense at Rogue Community College in Grants Pass, OR from 1978 to 1995. 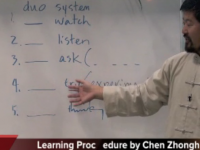 Brought George Xu (Xu, Guo-Min) to Grants Pass for weekend workshops from 1987 to 2005. Been to Shanghai four times with my wife (who also practices Tai Chi) to study martial arts with various people. Moved to Durango, CO in 2005 and live in a large house shaped like a pyramid. My wife and I practice Chen and Yang Style Tai Chi and Ten Animal Xing-Yi in our basement. First learned of Chen, ZhongHua from online videos and am trying to learn his Practical Method, because I think its structural movements are correct. I love your willingness to have your confidence repeatedly destroyed! Keep practicing!